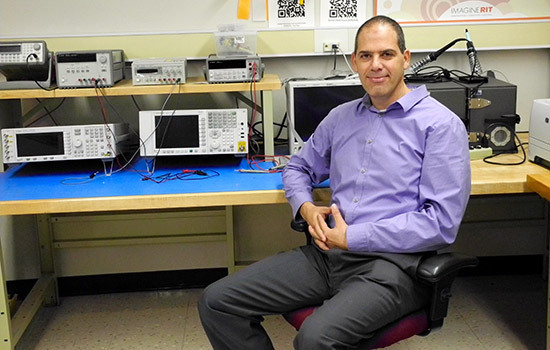 Gill Tsouri, associate professor of electrical engineering, is developing the video system algorithm and app for a new system to detect atrial fibrillation. Researchers are developing a health app to incorporate into familiar technology such as a tablet or smartphone that will act as a clinical tool to assess atrial fibrillation, a growing heart ailment. A team of engineers and clinicians at Rochester Institute of Technology and the University of Rochester Medical Center (URMC) received a grant from the National Institutes of Health to develop a non-contact, video recording technology to detect the presence of atrial fibrillation—a heart rhythm disorder that affects more than 2 million Americans yearly. The URMC received $2 million in funding for the project, and RIT will be granted nearly $800,000 from that funding for its portion of the collaborative project to develop the video algorithm. Co-project leaders are Gill Tsouri, associate professor of electrical engineering in RIT’s Kate Gleason College of Engineering, who is developing the video system algorithm and app, and Jean Philippe Couderc, a biomedical engineer and assistant director of UR’s Heart Research Follow-up Program Lab, who will lead the clinical trials. The video algorithm is one aspect of a trend in non-invasive medical sensing technologies that can help in assessing health conditions such as the onset, or progression of, atrial fibrillation. The application would be installed on a tablet and run seamlessly in the background while an individual is using the tablet. The software would record the individual’s heart rhythm for a longer monitoring period to capture data related to heart activity—compared to the shorter interval in a medical setting for EEG/ECG monitoring tests. Tablets will be provided to more than 260 patients expected to be enrolled in the study over the next four years. Participants will also wear an ECG patch, another means to monitor for atrial fibrillation. Researchers will compare data from the patch and the tablet to determine how accurate the tablet technology is in detecting the irregular heartbeats. “Our technology is unique because it requires no action on the part of the user aside from what they normally do – go on a tablet to shop, look at pictures, read articles, or whatever they like. If you are at risk for afib, you install it on your tablet or phone and don’t think about it anymore,” said Couderc, who also serves as associate professor of cardiology at URMC. Couderc has conducted a series of smaller studies that confirm afib can be detected from video of an individual’s face. The new clinical study will move the technology closer to commercialization. Couderc received additional funding from NIH’s Concept to Clinic: Commercializing Innovation (C3i) Program, which will provide training and tools to help bring this concept to market. According to the American Heart Association, atrial fibrillation can cause increased risk of stroke and heart failure. Electrical signals within the body drive the mechanical movement of the heart. Atrial fibrillation is an irregularity of the heart rate, specifically within the atria, the two upper chambers of the heart, due to a disturbance in the electrical activity. The app would not replace EKG/ECG monitoring tests that measure the electrical activity of the heart using contact-based sensing, but would replace PPG—a pulse plethysmograph that illuminates the skin and measures the volume changes in blood during a heartbeat. The app, with its unobtrusive technique and ability to capture more of this type of data, could determine, with a high percent of accuracy, an individual’s risk for atrial fibrillation, according to the research team. This proactive health care monitoring could potentially improve the broader health care services system allowing medical practitioners to better focus resources. Tsouri will enhance the app with new algorithms to ensure that conditions are optimal for capturing a video for cardiac monitoring. Movement by the individual or poor lighting, for example, could impact video quality. Tablet usage has increased over the past several years, and the applications on devices, particularly cameras, are improving, making the technology platform an asset in health care, Tsouri added. The unobtrusive aspect of the sensing work the research team is implementing can help physicians assess some cardiac conditions that cannot be detected in an ECG test taken once-a-year during a physical. “In general, where the world is going with mobile health care services, it should be viewed as another aspect of our digital life, and right now, we are not used to it—yet. But it is coming,” he said.